With just one day to explore Cairo, it's hard see all the sights—but with this comprehensive, full-day private tour, you can see more in less time. 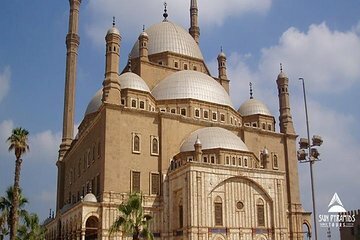 Explore the city's celebrated Egyptian Museum, stop at the Alabaster Mosque, and see the Citadel of Salah El Din. Visit religious sights in Coptic Cairo, and enjoy a Nile River dinner cruise, with a folklore show, set against the backdrop of Cairo's sparkling lights. With lunch, dinner, and service charges included, you can just back and soak up the sights.